Asko Appliances has a net total of 14 points, followed by The Kitchen Maker-Caesarstone and Winning Group on 15, Bing Lee on 17 and Smeg (Michael Coxon) on 18, and The Oak Double Bay-4 Pines (Aron Everett) on 27 points. Today’s first race was sailed over a three-lap windward-return course in a 10-12-knots SE breeze, then the following race was over two laps in a 6-7-knots Easterly breeze. 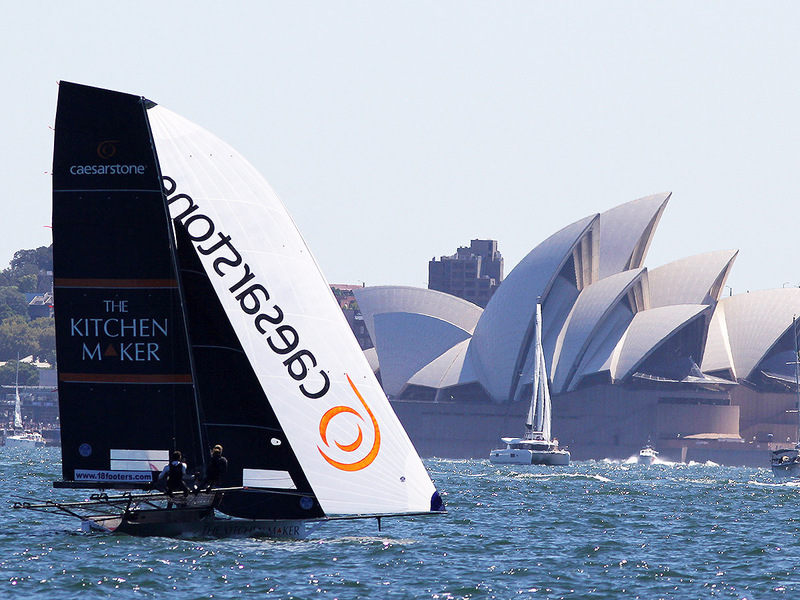 In Race 6, Winning Group held the early lead narrowly from Smeg, The Kitchen Maker-Caesarstone, Asko Appliances and Appliancesonline.com.au (Brett Van Munster) at the windward mark. Winning Group retained the narrow lead at the bottom mark but The Kitchen maker-Caesarstone was making a charge and soon grabbed the lead on the work back into the Rose Bay windward mark. The more experienced Asko team tried everything in an attempt to grab a victory, and the pair gybed several times before The Kitchen Maker-Caesarstone finally crossed the finish line with only 6s to spare. Race 7 looked likely to be another victory for Girdis and his TKM team when the skiff held a narrow lead over Bing Lee at the windward mark. Another close spinnaker battle developed, but this time The Kitchen Maker lost out when they lost wind off Steele Point and allowed three other teams to overtake. Winning Group were handicapped by a torn spinnaker but were still with the leading group which included Noakes Sailing (Sean Langman) and Smeg. Bing Lee’s team held a solid lead at the final windward mark but had to withstand a fast-finishing The Kitchen Maker-Caesarstone to take the honours by 6s – a similar winning margin to Race 6.